Allegory of the long journey into the secrets, emotions and dilemmas of the children of ours and every generation, represented through music, theater and dance by young people of the Galilee: from Nazareth to Safed, from the border with Lebanon to the border with Jordan. The Teatro Arcobaleno - Rainbow Theatre of Beresheet LaShalom and the "Lauda" ensemble are comprised of children aged 14-18 from the kibbuzim, the moshavim and the Arab villages and towns of Northern Israel. Together they created a petite insightful poem accompanied by pieces of Renaissance, Baroque and ethnic music from Frescobaldi to Bach, Vivaldi to the Rahbani brothers - played live by those that Zubin Meta forms as future musicians of the Israel Philharmonic and performed by teenagers who perceive dialogue, positivity and respect for each other as a way of life. Dr. Marina Minkin, artistic director of Lauda, Ms. Gili Jaeger, the group coordinator, and Dr. Angelica E. Calò Livné, the director of the Teatro Arcobaleno, have vast experience in music, theater and above all education. 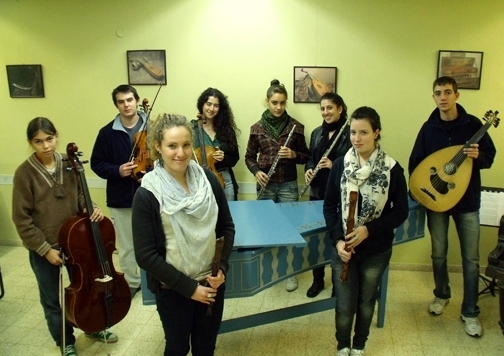 The multicultural youth ensemble 'Lauda' was founded at the Jezreel Valley Art Center 4 years ago, and it is performing in front of school students, in concerts and in various cultural events. 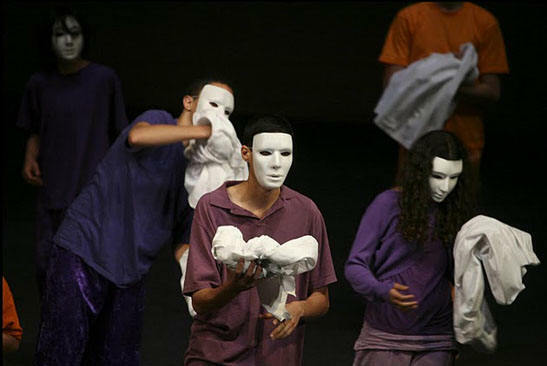 In September 2007, the center's ensemble represented Israel in the context of musical and cultural youth meetings that took place in Weimar, Germany. A deep understanding of the early music heritage that constitutes a source of present musical and cultural inspirations. The unique experience of performing various musical styles from different cultures, through a process of learning their folklore traditions. There are 12 participants in the ensemble, including male and female vocalists, wind instrumentalists (flutes, recorders, oboes), western and eastern-style string instrument players, traditional Arabic instrumentalists (oud, darbuka), and a harpsichordist. The singers and the musicians in the ensemble Jews and Arabs, Muslims and Christians express in a most beautiful way the unique and diverse Israeli culture of the Jezreel Valley Art Center. On January 30, 2012, US Ambassador to Israel Dan Shapiro will be meeting with Beresheet LaShalom at Kibbutz Sasa. 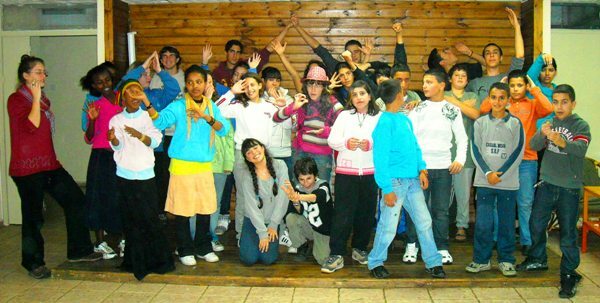 Beresheet LaShalom Foundation’s main goal is "To educate to the values of respect and acceptance through the arts" among groups of different ages, religions, cultures, languages and origins, in order to reach a positive social situation. 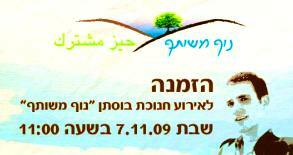 The radio program "Shalom Lecha Salaam" broadcast once a week, in Hebrew and Arabic. 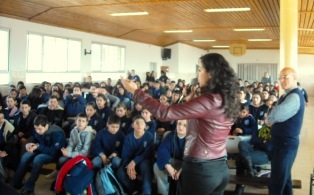 Environmental activities in schools of Regional Council Meron and Upper Galilee, and Arab villages in the region. Workshops for schools, organizations, cultural centers, universities in Israel and abroad, and at centers with people with special needs. Dr. Edna Angelica Calò Livné is the founder and the chairman of the foundation. You are invited to join us on January 30th at 2 pm at the Kibbutz Moadon. You must notify us in advance in order to attend. השנה, בשעה טובה, אנחנו חוגגים עשור לארקובלנו בראשית לשלום! הזמן עבר מהר ובקסם בין חיבוק לילד נפגע טרור, לשיחה עם כומר מכפר נידח בדרום איטליה, עם ניחוח של לחם השלום שנאפה במקומות רבים ומופעים בכתום סגול ומסכות לבנות על בימות של תיאטרונים של המאה 17, על שפת בריכה, בתוך יער: ברומא, ביפו, בורונה, אלטומונטה, בית שאן, פירנצה, ונציה ועוד עשרות מקומות אגדיים. חברי הגרעין התחילו לעבוד במרץ ובוגרי בראשית מכל התקופות, ידידים ותומכים מהארץ ומהעולם, הוזמנו לחגוג איתנו ביום חמישי 23/6/2011 בדשא של המועדון של סאסא בשעה 18,30. כולם הגיבו בהתרגשות רבה ובגעגוע! אנחנו מצפים גם לאורחים רבים מהארץ ומחו"ל, אנשים שלאורך השנים עזרו ותמכו בנו באהבה. העבודה רבה, מגוונת ויצירתית ביותר! הצטרפו לעשייה אנשים מסאסא נפלאים בהכנת התפאורה והתלבושות, הורי הילדים מהמצפים, מהקיבוצים ומהכפרים באזור וביחד מגשימים עוד חלום. בתוכנית אנחנו רואים: קבלת פנים (עם הרבה יין...יקב דלתון החליטו להתרגש אתנו) טקס, המופע "חי גלילאו" מאת ברטולט ברכט שעליו החברה עובדים כבר כמה חודשים, קטעי זיכרונות ובסוף דיסקו וכיבוד עשיר ורב תרבותי. גלילאו גלילאי הנו אחד מגדולי הפיזיקאים, מתמטיקאים ואסטרונומים של הרנסנס. דרך הטלסקופ שלו הוא ראה דברים שאי אפשר היה לראות לפני כן. המחקרים שלו ודבקותו לאמת ולאהבה לידע דחפו את העולם לשינוי. לפעמים גם לנו ניראה שקשה לראות יותר רחוק, אך השינוי יבוא...וכולנו נזכה ליותר ויותר אור! 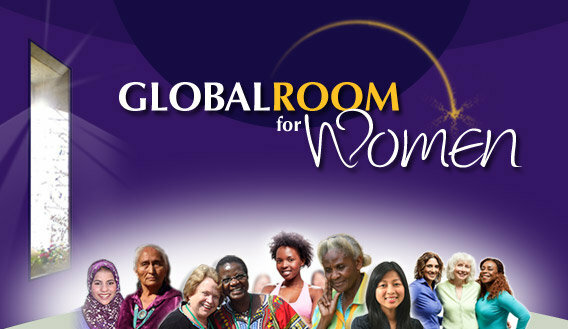 "With love from the Middle East: Meet (Celebrate) the Women Building Peace"
הצופים הצעירים יחוו במסע קסום יחד עם השחקנים הצעירים את הנס בו נהפכת בובת העץ ללא מצפון לילד בשר ודם ובעל ערכים ונשמה. מופע "בראשית", פרי יצירתם של צעירי התיאטרון בלווי מוזיקה מקורית. במופע מביעים הנערים בתנועה וברגש את כמיהתם לחיים ללא אלימות, להבנה הדדית, לקירוב לבבות בין שונים הנלחמים ללא תקווה. Today we had a marvellous experience, we performed Beresheet at the Arab School in Acre in front of an audience of 300 mixed denomination Arab youngsters. I had the privilege of meeting Father Quirico Calella through my friend Stefano Roversi. Stefano was serving with UNIFIL in Lebanon and put us in contact. I discovered that besides being a delightful and courageous person, Father Quirico, of the Order of Franciscans, is the director of one of the best Arab schools in Israel: the Holy Land School of Acre. Approximately 600 students from kindergarten to high school, Christians and Muslims. After we met many times at engagements at the Italian Embassy, I went to visit him with Maria Grazia Balbiano before Christmas and she launched the idea that he invite Beresheet to be performed at his school. Today, at last, this thought also came true. This evening I received an extraordinary email from a young girl who attended the show. 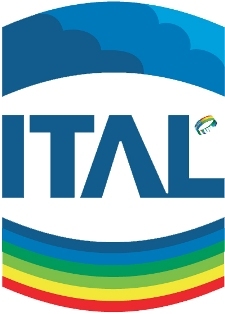 . .
On February 26 the ITAL will organize in Rome at the Hotel Aran Mantegna its National Assembly to be attended by our representatives from around the world and from different regions of Italy. It is a great pleasure to invite you to open the proceedings of our Assembly with the spectacle of theater and dance Beresheet conducted by young Jews and Arabs of the Galilee. It will be for all of us an important opportunity for reflection on the value of dialogue and meeting as a means to reduce the fear and hatred between peoples. 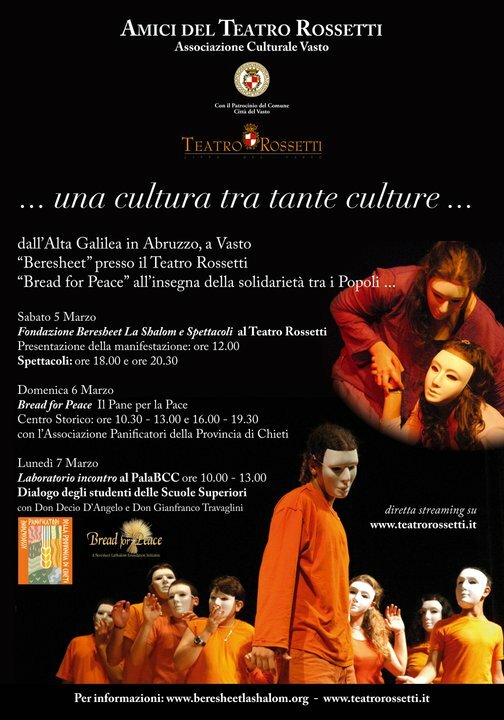 (ANSAmed) - ROME, JANUARY 22 - A work of non-fiction to address music, mime and dance, interpreted by 80 Israeli and Jordanian high school students to tell the story of suffering in conflicts and the hope for peace in the Middle East. These are the elements that come together in the show Beresheet ('In Principlé), which Thursday January 28 at 5.30pm, will bring youths from the school of Eilat and Aqaba to the Santa Chiara parish in Rome, expressing the essence of the path of encounters and dialogue during the 'Aqaba-Eilat Project: One More Step Towards Peace'. 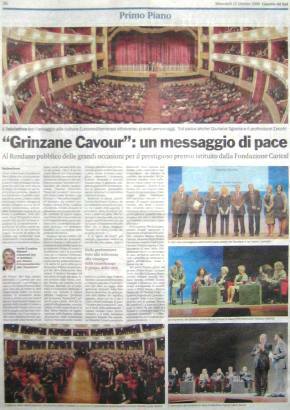 A project desired by the European Union and undertaken by the Italian Institute for University Cooperation, the NGO which, together with the collaboration of Angelica Edna Calò Livné, has managed to bring in recent years the show to Italy, Spain, Switzerland and Israel. Beginning in 2001, in Upper Galilee, where the offices of the educator and director Calò Livné are located, Beresheet LaShalom, the theatrical representation has the objective of creating dialogues and encounters for youths from different religions and backgrounds through the arts. "I hope that", Angelica Edna Calò Livné said, "these kids which have learned to speak together, start down a path of closer relations and exchange that will not be interrupted when the project is over. I imagine that tomorrow there will be doctors capable of working on the same staff, businessmen that bring important projects forward together, prominent women and men who will change things because they are aware that there are people just like them on the other side". 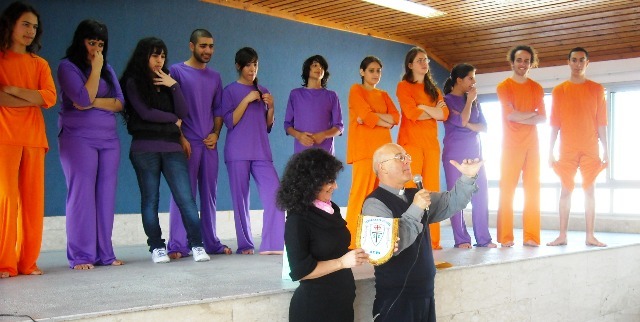 At the end of the theatrical production played by the students of Sister Rosary in Aqaba and Izchak Rabin in Eilat there will be a meeting with representatives from the Roman Islamic and Jewish communities with volunteers from the Community of Sant'Egidio. (ANSAmed). I hope that you are ok! All we say is: THANK YOU, THANK YOU and THANK YOU!!!! We are very proud of you! And we thing that we are networking not only with Angelica but with please an angel! thanks for the CD you sent! I follow in the news some images of Christmas in Palestine! it is good like a sign! Let God almighty help us for all other things!!!!! My greetings to Dr Yehuda and all your family! كل ما نريد أن نقوله لك هو: شكرا جزيلا!شكرا جزيلا! وشكرا جزيلا. نحن فخورين جدا بك!ونحن نعلم أننا لا نتواصل فقط مع انجيليكا-عدنة ولكن أيضا مع ملاك!نشكرك على الاسطوانة! وبعثت أيضا صور من عيد الميلاد في فلسطين! يا ريت لو بمقدور ربنا العظيم أن يساعدنا في باقي الأشياء. سلامي إلى زوجك يهودا ولكل أفراد عائلتك! שלום לאמא עדנה קלו-ליבנה היקרה! אני מודיעה לך שהצלחתי לקבל את החבילה שלך, ושלמזלי הכל היה בפנים. קראתי את המכתב האישי שלך אלינו. ווירג'יניה ואני מקבלים בברכה את הרעיון שאנחנו צריכים לבנות גשר בינינו... אנו מקווים שהגשר הזה יהיה באמת חזק ויהיה מלא במשמעויות חיוביות... כל מה שאנו רוצים להגיד הוא: תודה רבה! תודה רבה! ושוב תודה רבה!!! את יודעת עדנה, שאנו מחלקים את כל מה שהבאת לנו לילדינו היום, בגלל שאירועי חג המולד הגיעו... אנו מאוד גאים בך! ואנו חושבים שאנחנו מתקשרים לא רק עם עדנה-אנג'ליקה, אלא באותו זמן גם עם מלאך! תודה גם על הדיסק ששלחת. בנוסף למכתב התודה אני שולחת לך גם כמה תמונות מחג המולד ברשות הפלסטינית! The most famous puppet in the world in recent weeks has landed in Israel. 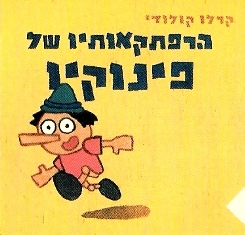 The tale of Pinocchio, an original stage version, was in fact represented at Jaffa in Tel Aviv, in two languages: for Arab and Jewish children. Objective: To contribute to the peace process supported by the European Union in which the civil society can take part in establishing a new phase based on equity and reciprocity. Goals: Improve the dialogue and mutual knowledge among the students of Rosary Sisters School of Aqaba and Rabin High School of Eilat. On November 8th, we performed “Beresheet” in Eilat, the southern most point in Israel. Along with the Garin Moriah members, 5 teens from the Arcobaleno travelled with us. We started our journey at 4 am from Mount Meron Field School in the Galilee, towards Eilat, and after 8 hours of driving we got to Matnas Sachmon (Sachmon Community Center) where we were to perform and started to prepare. 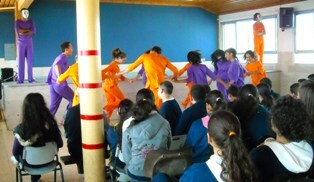 The show was a part of the Aqaba – Eilat: “Two Cities in the Mirror” program, which deals with communicating and progress towards peace. 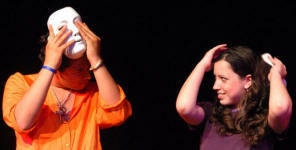 It was performed for 40 teens from Aqaba, Jordan and 40 teens from Eilat, Israel. Edna Angelica Calò Livné, who saved the program from failure, had decided to bring us to perform in front of the teens (who had not met for 6 months) to plant hope in them to continue with the program. The show was very successful, and in it we also combined a group of Aqaba teens who danced the Debka and helped us to lead the audience to dance. 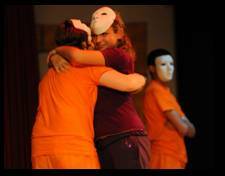 After the show the 80 teens were divided into 5 groups: dancing, theatre, singing, journalism and art. In each group were 2 of the Garin members who facilitated and inspired the teens to work on their grand finale project set to take place in January 2010. The final project’s theme will be co-existence and tolerance, and will perform in both Aqaba and Eilat. The work in the various groups was great, and was fascinating to watch the Jordanian and Israeli teens collaborate and connect. After the special activity at Rabin High School in Eilat, we went to a fun night in the never-sleeping city of Eilat, and stayed at the Eilat Field School Hostel. The following day we continued our tour on the promenade and at the beach, and at noon we set out to drive north again. In mid-journey we stopped for a delicious lunch and a fun visit at Ohad’s house (one of the Garin members), in Kibbutz Bet Nir, and after that we continued to the Galilee. In summary, we really enjoyed the work with the teens, we experienced a lot of teaching practice, and were charmed by the amazing teens who want to change the public’s consciousness and the reality. We hope that we will be able to see the grand finale show of the project, performed by the Jordanian and Israeli teens, and we hope to have inspired them to continue with the project. Happy and excited, until next time – Ohad on behalf of Garin “Moriah”. 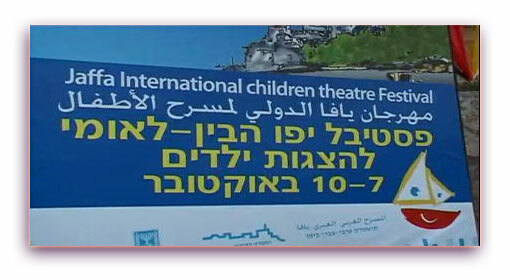 We shall present a performance of "Beresheet"
His parents created a park in his name. 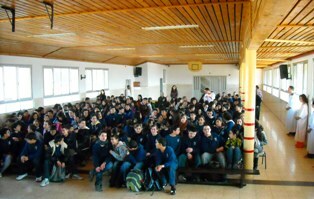 Shnat Sherut Crew at Mount Meron. 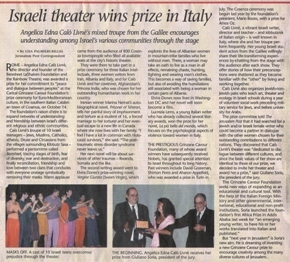 Media Coverage of Members of Garin Har Meron & the Arcobaleno-Rainbow Theatre. 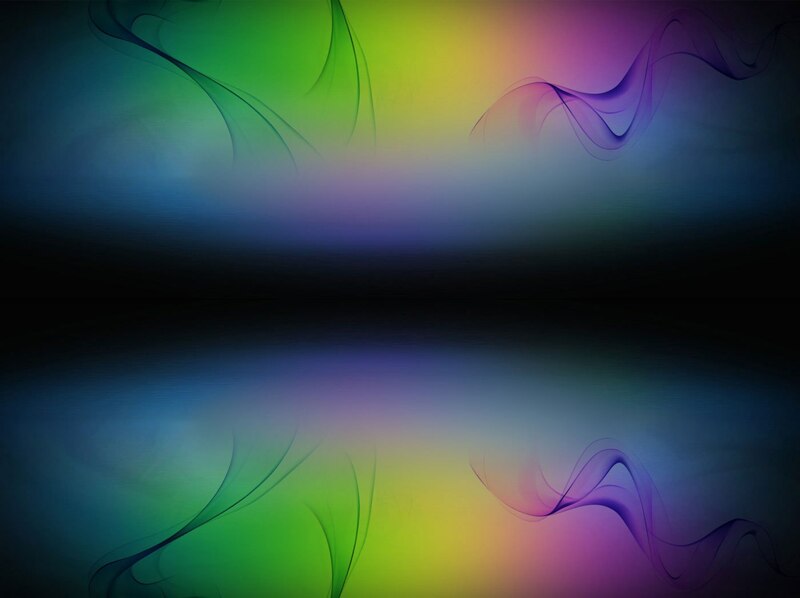 LISTEN TO A BROADCAST !